New report: APP is putting forest and carbon-rich peatlands at risk with new pulp mill. As country representatives gather on April 22 to sign the Paris climate change agreement, this analysis of APP’s mega-scale pulp mill project suggests that Indonesia and China’s largest pulp and paper producer may fail to fulfill its “zero deforestation” commitments and pledges to tackle climate change made in 2014 at the New York Declaration on Forests and in 2015 at the Paris COP-21. The mega-scale pulp mill will add significant challenges for Indonesia to prevent catastrophic fires in the region and to achieve its international climate change commitments, according to the organizations co-authoring the study, which include WWF, Wetlands International, Rainforest Action Network, and Indonesia’s Anti- Forest Mafia Coalition. “APP has not publicly released a credible plan showing its plantations can grow enough wood for all three mills over the long term,” said Aditya Bayunanda, Forest Commodity Leader for WWF in Indonesia. “If faced with shortages of fiber, we are concerned that APP could default on its ‘zero deforestation’ commitment and resume using large volumes of wood from natural forests at its Sumatra mills,” cautioned Bayunanda. The analysis in the report indicates that the company’s current planted area, even under a high growth rate scenario, will not be sufficient to supply APP’s two existing pulp mills in Indonesia and the new mill at installed capacity levels. The company has stated it would import wood in the case of shortages, but the report indicates this would involve considerable extra cost and could impact the mill’s profitability. The OKI Pulp & Paper Mills project, approaching $3 billion in investment, will expand APP’s wood demand in Indonesia by over 50%, with much of this coming from plantations on high-carbon peatlands. The mill is primarily financed by $2.5 billion in loans from China Development Bank and ICBC Financial Leasing, putting financial pressure on APP to run the mill at full capacity. In 2013, APP made a set of sustainability commitments that included “zero deforestation” in its supply chain and “100% sustainable plantation wood for pulp.” Five months after making these commitments, the company announced it would build the OKI mega-scale pulp and paper mill. 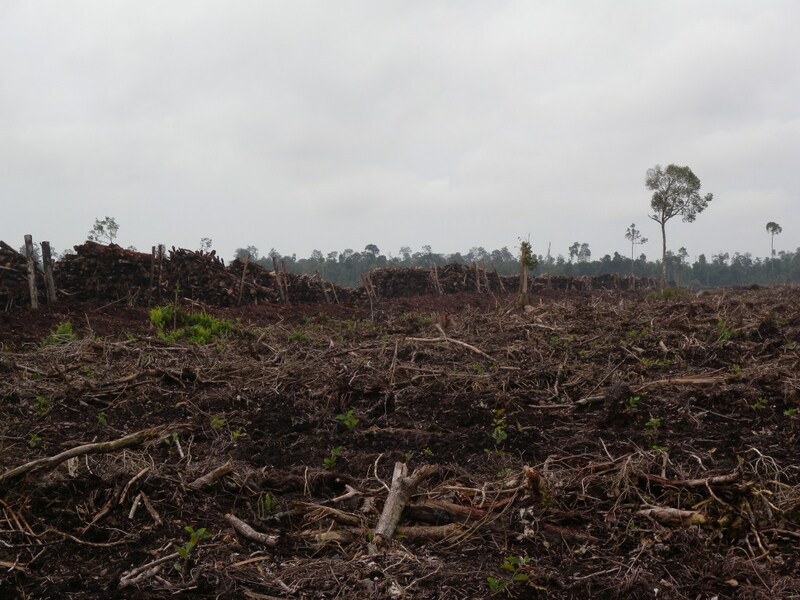 Finding that 77% of the group’s South Sumatra concession area is on high-carbon peatlands, the report questions whether APP’s plantations will be able to sustain intensive pulpwood production over the long term. 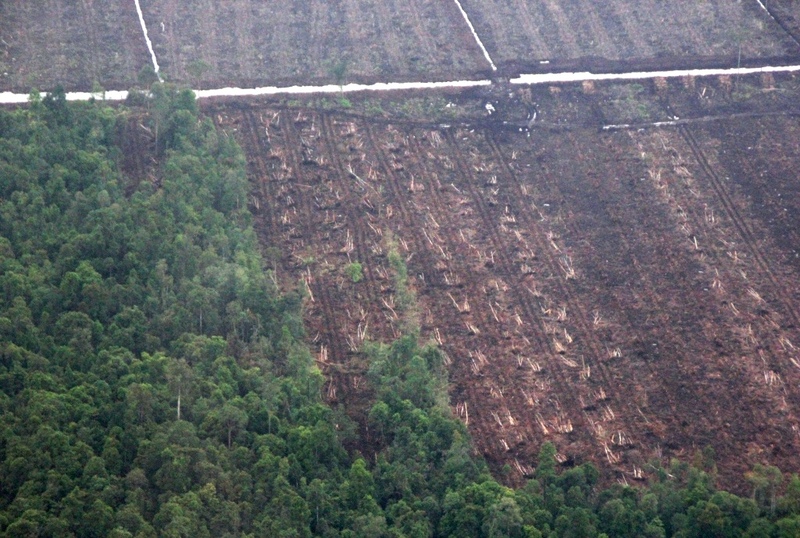 When drained to establish plantations, these peatlands become highly susceptible to fire. Over time, many areas will also face flooding problems, as draining peatlands causes subsidence, which gradually lowers the ground surface level and can result in prolonged flooding. 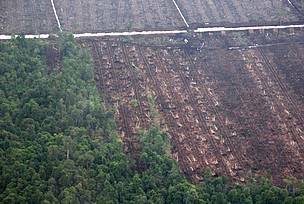 A 2015 study on peatland plantations on the Kampar Peninsula, also in Sumatra, showed that subsidence and associated flooding would make many pulpwood and palm oil plantations unviable within decades, resulting in degraded landscapes with little or no economic use. “Peatlands in South Sumatra are generally shallower then on the Kampar peninsula, and APP’s plantations will therefore subside to flooding levels much quicker. In fact, flooding during the wet season is already happening in parts of the plantations, raising critical questions about how long OKI’s plantation base can remain productive if peatland drainage continues,” said Marcel Silvius, a peat expert at Wetlands International. APP has, by its own count, several hundred conflicts with local communities whose lands overlap with the company’s pulpwood concessions in five provinces. Land conflicts, as well as damaging community livelihoods, can undermine plantation productivity by causing disruption of operations, damage or destruction of planted areas, loss of concession area, and in some cases, violence. For the last three years, APP has committed to negotiating with communities to resolve conflicts, but the process has only resulted in partial agreements with three communities, according to the report. 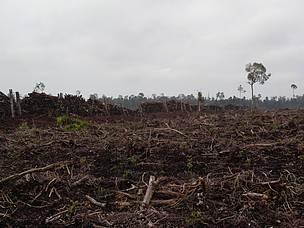 APP has pulped timber from more than two million hectares of natural forest to feed its two existing mills in Sumatra, according to Eyes on the Forest. For many years, the group has been criticized for destroying forest ecosystems, displacing rural communities from customary lands, and contributing to global warming by developing high-carbon peatlands. But APP’s sustainability commitments in 2013 neutralized a global campaign against the company and provided a supportive environment during which it built its new mill. However, there is growing concern that OKI’s mega-scale pulp mill will lock-in a much more expansive resource footprint than APP has had until now. “In evaluating purchasing and investment options, buyers and investors should require truly independent assessments to verify APP’s sustainability performance and fiber supply plan,” said WWF’s Bayunanda. “Without verifying sustainable operations through such assessments, there is a risk that buyers will be associated with the next wave of deforestation in Indonesia,” he emphasized. APP supplier concession in Riau, Sumatra, 29 May 2013.